The Honeywell Analytics Fire Sentry FS20X Fire and Flame Detector is the latest generation high technology Multi-Spectrum (UV/Dual IR/VIS) Fire and Flame Detector, which is part of the FSX family of advanced technology Electro-Optical Flame detectors. Based on the foundation of the highly successful and reliable Fire Sentry SS4 detector, the Fire Sentry FS20X detector represents a quantum leap in integrating Infrared and Ultraviolet sensing technologies. 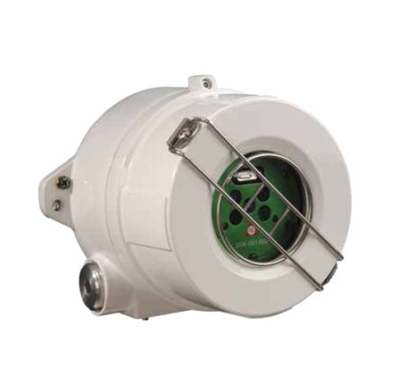 The Fire Sentry FS20X is a Multi-Spectrum and UV/Dual IR/VIS fire and flame detector with a proven UV solar-blind sensor. The Fire Sentry FS20X exhibits faster false-alarm free response to fires over a wider temperature range and with a much longer detection range compared to conventional UV/IR detectors. Conventional and older technology UV/IR detectors, using narrow band 4.3 micron IR sensors, will not respond to smoky fires or if the detector lens is contaminated with oil and other substances since both UV and 4.3 micron signals are attenuated, obscured or absorbed by thick smoke or detector lens contaminations. Also, these old technology UV/ IR detectors will not alarm to any fire if they are installed behind ordinary window glass. The Fire Sentry FS20X detector using advanced patented algorithms for signal processing and fire and flame analysis is designed to alarm to all types of fires in all industrial environmental conditions. If the detector’s UV signal is degraded due to heavy smoke or a contaminated lens, the Fire Sentry FS20X’s patented* WideBand IR™, Near Band IR and Visible sensors will still alarm to fire, albeit at a reduced sensitivity and slower response time. Dual microprocessors provide a high level of fail-safe operation combined with fast and reliable performance. The master microprocessor performs high-speed digital sampling and signal processing calculations whilst the slave microprocessor handles various sensor data, performs communications, self-diagnostics and provides interface versatility and additional memory for storing event log and FirePic™ data. The Fire Sentry FS20X detector has a detection range in excess of 60 m (200 feet) (very high sensitivity setting) for the detection of a 0.1m2 (one square-foot) Heptane reference fire and has a cone of vision greater in volumetric coverage than most UV/IR detectors. This means fewer detectors can be used as compared to other manufacturers’ detectors.